After the vote is over and the hype dies down, shares could well be in for a sell-off. Next Tuesday, when all eyes will be on who will become the next President of the United States, there’s another vote going on: on marijuana. Five states (California, Nevada, Maine, Massachusetts and Arizona) will vote on recreational marijuana laws, while four states (Florida, Arkansas, Montana and North Dakota) will vote to legalize medical marijuana in some shape or form. Polls so far suggest a sweeping victory for the legalize camp, with a clear majority of voters showing support in most states. In anticipation of this result, marijuana stocks have been on fire in October, before backing off a little last week. Although it’s a well known fact most marijuana stocks are low quality, traders bid them up regardless. In this article I’ll take a closer look at Cannabis Sativa (OTCQB:CBDS), which is up almost 800% this year, now trading at a market cap of over 100 million dollar. But what does Cannabis Sativa actually do? And who are the people running it? And in what way would it benefit from a favorable outcome in Tuesday’s vote? Cannabis Sativa tells investors it is “engaged in the developing and promoting of natural cannabis product”. Essentially, it’s a webshop though, also selling through Amazon. Over the first six months of 2016 Cannabis Sativa generated65,000 dollars in turnover, and turned a loss of 380,000 dollars in the process. Those are pretty ugly numbers and let’s be honest here, there are people out there selling stuff from the back of their truck that generate more revenue, but as investors in cannabis stocks are led to believe: investing in cannabis is all about the future, not about the present. Cannabis Sativa sells a number of products with CBD in it. CBD is a chemical compound in a marijuana or hemp plant. Unlike THC, another cannabinoid, CBD doesn’t “get you high” and is being researched around the world for a wide range of medical applications. The products that Cannabis Sativa sells are already legal everywhere in the US as they are sourced not from cannabis, but from foreign industrial hemp. However, because of this, many experts question whether the (very low) concentration of CBD in those products really still has any positive effect on those who consume it. The flagship product of Cannabis Sativa is no doubt a bottle of CBD Infused Water. Cannabis Sativa describes the water on its website as being “formulated using a revolutionary nano-sizing process”. That might well be the case, but Cannabis Sativa is not the one doing the formulating. The bottled water is produced by a Swiss company called Isodiol. When asked, Isodiol confirmed to me they did a “white label deal” with Cannabis Sativa. Basically, this means Cannabis Sativa sticks a new label on the bottle and then brands it as its own. The same seems to apply to most products in the Cannabis Sativa webshop. For example, its Hi CBD Rich Hemp Oil products are produced by a company called Centuria Natural Foods. Of course, there’s no shame in being a mere white label re-seller; many companies are. But Cannabis Sativa desperately wants investors to believe it “is Marijuana”, and is prepared “to shape its future” (quotes from their website). Not just a company with tiny revenue, that doesn’t actually grow or produce much, hardly owns anything and just from time to time pushes a few boxes around with other companies’ product. In its attempt to be taken seriously Cannabis Sativa in its latest annual filing uses the words “research and development” fourteen times. Cannabis Sativa didn’t actually spend a single penny on R&D in 2015. Not that surprising considering the company only has two employees. In 2010 a predecessor of Cannabis Sativa filed three patent applications with the USPTO, of which one was with regards to a specific strain of cannabis plant; none of those applications have ever been granted to date. Cannabis Sativa keeps using the term “patent pending”, but after six years later it seems unlikely patents will ever be granted. So then what does Cannabis Sativa really own? Not a whole lot of cash, that’s for sure, less than 35,000 dollars per June 30th. However, according to its own balance sheet it does own quite a lot of digital currency: 110 million “hempcoins” and 900 million “garycoins”. The hempcoin, not to be confused with another virtual coin also called hempcoin, is a virtual currency that oddly enough doesn’t appear to have anything to do with hemp. It is unique in a way that it’s supposedly the first digital coin ever backed by a marketable security. Every ten hempcoins are backed by one share of publicly traded nano-cap Rocky Mountain Ayre. In theory at least. Let’s for a second ignore the obvious regulatory concerns as well as the glaring fundamental flaws concerning this setup. At current market prices one could make a quick 4500% arbitrage profit by converting Hempcoins into shares RMTN, right? Well, no, in practice things are different, as there doesn’t seem to be any possible way to actually convert the Hempcoins into shares, making it a completely mystery what this “backing” actually entails. I’ve asked Rocky Mountain Ayre about this, but no response. Hempcoins appear to be intrinsically worthless. Cannabis Sativa also owns “garycoins”, but when even Google has no clue what those are, you know you are probably not dealing with the most liquid of digital currencies. Still, after some searching I found the website coinmarketcap.com not only knew what garycoins were, but also reported the coin had seen a whole 3 bucks worth of trades in the last 24 hours. And these last couple of weeks that was about an average trading day. The garycoin in some mysterious shape or form appears to have something to do with 2016 Libertarian presidential candidate Gary Johnson (more about him later in this article), but everything else is a complete mystery. Even the website the coin links to doesn’t work. Why any serious accountant would sign off on attributing any sort of value to 900 million make-belief illiquid coins, I have no idea. First, it decided to spin off part of its “assets”. On the 30th of October 2015 shareholders were promised shares in a new company called KUSH. KUSH was supposed to be managed by industry veteran Steven Kubby and should have IPO’d shortly after it was spun out of Cannabis Sativa. Fast forward to 2016, KUSH did indeed spin off, but never went public. Some Cannabis Sativa shareholders report receiving KUSH shares in their broker account, but can’t trade them as there is no market. Also, nobody knows what those shares actually represent. Meanwhile, supposed CEO Steven Kubby resigned and didn’t exactly inspire a lot of confidence in the KUSH shareholders he left behind as upon leaving he wrote a post on his Facebook-page basically calling all publicly traded marijuana companies a scam. A small glimmer of hope remains as the new CEO, Carl Sanko, told me he still has plans to take KUSH public. Also, a website has been launched. A quick click-through basically shows an empty shell though. 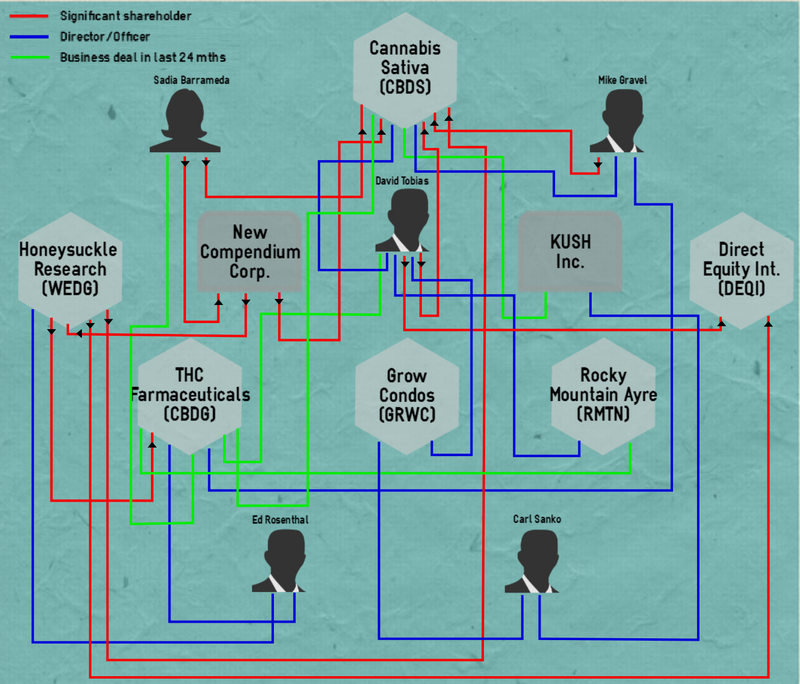 The second corporate action Cannabis Sativa undertook was an even bigger disaster. For unclear reasons, the company wanted to apply a 1.5 (restricted) share special dividend for every share CBDS outstanding. It set a record date in November 2015, but did so before getting approval from regulatory authority FINRA. After no communication for months, in August Cannabis Sativa retro-actively had to cancel the record date, as FINRA flat-out deniedthe split. I’ve asked FINRA for details, but they told me they couldn’t comment as corporate applications are confidential. In its everlasting urge to look like one of the big boys of Wall Street, in September 2015 Cannabis Sativa mentioned for the first time it had submitted an application to “uplist” from the OTC to Nasdaq. Penny stock investors typically love this kind of news. Perhaps that’s why the company then went on to repeating the news twice in a filing in May 2016, and then again in a filing in August 2016. Now, fourteen months after the initial application was supposedly send, no progress or update. For the record, Nasdaq’s own listing guideprovides a timeline from application to approval (or denial) of five to six weeks. Let’s move on to the management of Cannabis Sativa. The CEO of the company is 86(! )-year old former senator and former presidential candidate Mike Gravel. Despite his age, Gravel is still quite active on social media, posting about different (political) topics. Not about Cannabis Sativa though. And definitely not about THC Farmaceuticals (OTCPK:CBDG), another cannabis company he is supposed to be the CEO of (on paper, at least). THC Farmaceuticals stopped filing with the SEC in 2015 and didn’t even bother paying the annual fee of the Utah Chamber of Commerce this year. It appears to be a trend among penny-stocks and the persons who run them behind the scenes to appoint people of some fame to key positions. A former politician, a former judge, anyone of some stature who has fallen on hard times. Perhaps this also explains why Gary Johnson, the Libertarian nominee for the 2016 US presidency, served as the CEO of Cannabis Sativa for eighteen months, before resigning in the beginning of this year to focus on his campaign. We might very well see Johnson, who supposedly still owns 500,000 shares of CBDS, return to his position at Cannabis Sativa soon after the presidential elections are over. His political days seem to be numbered after a series of “unfortunate” media appearances (1 2) and having been stabbed in the back by a number of fellow libertarians (1 2 3) during his campaign. But ultimately it won’t matter all that much who is the CEO of Cannabis Sativa as the person that’s really pulling the strings is its President and major shareholder, David Tobias. One could say Tobias is “the Godfather” of cannabis penny stocks. Apart from his current job at Cannabis Sativa, he’s also a former director at Hemp Inc (OTCPK:HEMP), Medical Marijuana (OTCPK:MJNA) and Medican Enterprises (OTCPK:MDCN), currently a director at Grow Condos (OTCQB:GRWC) and Rocky Mountain Ayre (OTCPK:RMTN), and he owns a large number of shares in Direct Equity (OTCPK:DEQI). It’s worth noting Tobias, but also other CBDS shareholders, hold stakes in penny stocks, that are connected to each other in many ways. Assets are regularly sold from the one to the other, directors moved around from the one to the other. See the diagram below for more detail. Almost as important as Tobias, is the other major shareholder of Cannabis Sativa, Sadia Barrameda (a.k.a. 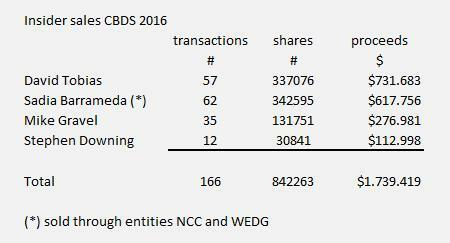 Sadia Ross), who holds close to one third of all shares CBDS outstanding; partly in her own name, partly through a holding company called NCC, and partly through a (theoretically, because extremely illiquid) publicly traded entity (OTCPK:WEDG) she indirectly owns over 90% of. Barrameda is quite a fascinating character, and only in part because she is raising a child with a man who got banned from trading pennystocks for life by the SEC after orchestrating a pump-and-dump (and did a lot of other bad things in his younger days). Barrameda, also an aspiring writer, used to own a high-end fashion boutique, featuring a number of luxury brands. Or at least, that’s what customers presumably thought she was selling. In December 2014 she was sued by French fashion giants Louis Vuitton (OTCPK:LVMHF), Celine and Christian Dior (OTCPK:CHDRY) after apparently being caught selling counterfeit product. Later her holding company NCC, that holds a large amount of CBDS shares, was also added to the suit. The plaintiffs, who were worried about a flight of assets, were even granted a temporary freeze of Barrameda’s and NCC’s assets, including the CBDS shares. That freeze was later lifted again, although “the Court has no difficulty in concluding that Plaintiffs have demonstrated a likelihood of success on the merits of their [..] claims against Barrameda”. Trial has been postponed several times and is now scheduled for April 2018. One would expect Cannabis Sativa to disclose to its shareholders a material part of its outstanding shares were at one point the subject of an asset freeze, and that a significant shareholder is still the subject of a lawsuit that could have serious financial consequences. No such disclosure ever occurred though. Now that you’ve been introduced to the Cannabis Sativa insiders, let’s take a look at what they’ve really have been doing this year: sell stock. Since the beginning of 2016 Tobias, Barrameda, Gravel and independent director Downing have together reported ZERO insider buys, and 166(!) insider sell transactions. Tobias sold over 700,000 dollar worth of stock, Barrameda sold over 600,000 dollar worth of stock. The spectacular run-up of the CBDS stock price over the last month might very well have induced even more insider sales. Cannabis Sativa insiders usually file several weeks of insider sales at once, despite SEC regulations dictating any insider sale should be reported “on the end of the second business day following the day on which a transaction [..] has been executed”. Also, the number of shares these insiders hold don’t go down by all that much, as most of them are constantly issued new shares, in many cases in exchange for unidentified “services”. As long as traders believe Cannabis Sativa shares have some sort of value, insiders make money. They create new shares out of thin air and sell them on in a never-ending cycle. Note: one day after these tweets, on July 27th, Barrameda sold 4,000 shares. Note: one day after this tweet, on September 8th, Barrameda sold 4,600 shares. Usually when researching a stock you have to take a long look before finding any red flags. In the case of Cannabis Sativa, they’re literally everywhere. The company is trying to cash in on the marijuana hype, but essentially contains of nothing more than a tiny webshop and insiders dumping stock. If Cannabis Sativa would be generating similar revenues selling something like kitchen appliances instead of CBD-related products, it would have been someone’s part-time hobby, not a publicly traded company with a 100M market cap. It’s all hopes and dreams, and absolutely no substance. Investors looking for early exposure to the upcoming marijuana boom should be looking for companies that either have unique assets, or companies that have cash (or preferably both). Cannabis Sativa clearly has neither. There are lots of companies like Cannabis Sativa that are publicly traded, and not just in the cannabis space. They trade on hype alone, and those that trade them don’t care about fundamentals. Cannabis Sativa doesn’t do offerings, they don’t have convertible debt, the issuing of new shares is mostly monopolized by insiders. These insiders slowly unload their shares, opposed to toxic debt holders who typically dump all at once. Without any short term catalyst, and barring any SEC involvement (although they have plenty to investigate in this particular case) egregiously overvalued stocks like this can stay that way for longer periods of time. Generally, they’re completely uninvestable. However, certain special events, like Tuesday’s vote, can sometimes pose an attractive shorting opportunity, as it allows to sell the hype at temporary inflated prices. When the vote ends, and the hype dies down, the sell off can be quite vicious. Longer term, ironically, a positive outcome of the upcoming vote that has been driving the Cannabis Sativa share price higher these last few weeks, is a very clear negative catalyst. A nationwide legal marijuana industry could, according to recent analyst estimates, be worth 50 billion dollars by 2026. As especially CBD-based products might well become a household product over the coming years, companies with serious plans and serious money will enter the market and hype will be replaced by fundamentals. By that time, Cannabis Sativa will no doubt have long been wiped out. Disclosure: I am/we are short CBDS, GRWC.